In stock - low quantity. Order in the next 7 hours, 2 minutes and it will go out today! The Magician shows a small bird cage with a small bird inside. In the blink of an eye the bird and cage vanish into thin air! This illusion is very easy to perform and is very visual. The Vanishing Bird's Cage is a real classic of magic. In the hands of the right performer it seems that the Cage visibly dissolves into nothing. 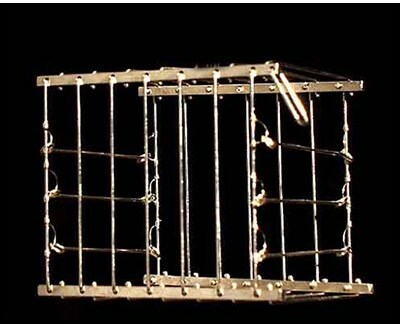 The apparatus supplied is perfect in every respect, the Cage stands upright but when squeezed at the opposite ends the whole Cage collapses into a long metal strip which can easily be concealed under the arm.